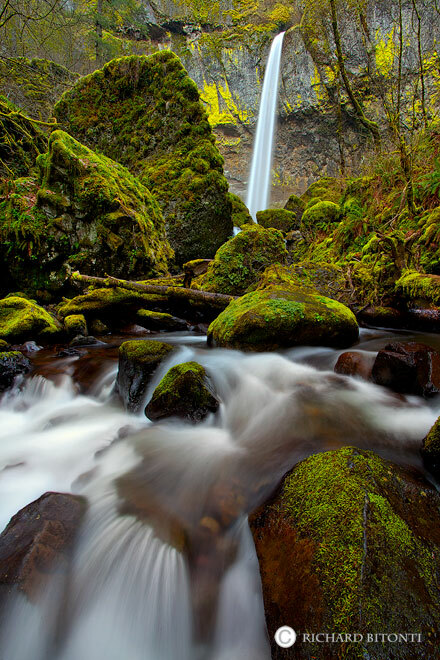 Elowah Falls is one of the hidden gems in the Columbia River Gorge. The falls flow year round, but are best in the late winter and spring, like many others in the area. The cliffs on either side of the falls are flanked with the colorful yellow-green lichen found throughout the Columbia Gorge, adding a lot to the aesthetics of the scene. Photo © copyright by Richard Bitonti.